Don't you wonder where some of the TEA Party “patriots” and holdover States Rights' Dixiecrats get some of their unusual ideas about both the Constitution and the causes of the Civil War? Wonder no more. A lot of your fellow citizens (aged 50+) learned it in their Alabama History books. 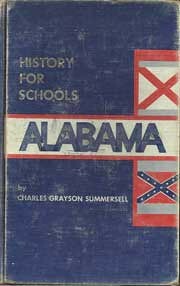 I recently happened upon a copy of Charles Grayson Summersell's 1961 textbook: Alabama History for Schools. While thumbing through the text, I was introduced to a totally alternate reality: one that should have been totally discarded a LONG time ago. It's a world where benevolent Alabama slave owners treated slaves better than “Northern slave traders,” slaves received “the very best medical care,” were covered by an early version of Social Security, secession was forced on the South by the “vocal minority of abolitionists” in the North, and those Southern secessionists were merely upholding their rights under the US Constitution. Swear to God. This book is jaw dropping in its worldview. Even scarier – it was taught in schools in my lifetime. Daddycat recognized it as the textbook he had in 9th grade in Madison County in the late 1960's! According to these activists, the Founding Fathers never wanted a separation between church and state, and they’re doing their best to break down the wall by changing the schoolbooks in Texas. Some of these guys would have LOVED Summersell's book! On the flip, we'll start our review of the book with Chapter 17: People During Slavery Times. If you're lucky enough to have the book, start on page 229 (PDF copy here). …. I might should say “if you're UNlucky enough to have this book” – except that the value may skyrocket if the TEA partiers start looking for copies to wave as examples in front of publishers and legislators. The master supervised both the driver and the overseer. Occasionally, a master had a pair of binoculars and watched distant workers from the upper story of his plantation house. Thus the stage was set for some lazy field hand who went to sleep beside his job to get the surprise of his life from the master who had been watching him with the field glasses! Good thing the field hand was “generally” well treated or something bad might happen. Slaves occasionally sold chickens and vegetables, and with the money thus earned, bought special luxuries, such as candy, coffee, tea and sugar. Christmas and other holidays usually brought special feasts. When crops were laid by, faithful workers were often rewarded with a particular treat, such as a barbecue. Charles Lyell, the British geologist, told of a party that certain slaves gave for their friends at which they served roast turkey, jelly, ice cream, and cakes. Such feasting was unusual, however. A few slaves were lucky enough to get castoff clothes from the big house. In clothing, as in food and housing, the slave enjoyed little or no luxury but suffered little or no want. In one respect, the slave was almost always better off than free laborers, white or black, of the same period. The slave received the best medical care which the times could offer. There are plantation records which show large sums spent on doctors' bills for the care of slaves. The ill health of the slave meant a loss of working time to the master, and the death of a slave was a great economic loss. Geez… sounds like the slaves had better medical care then than poor folks in Arizona get now. With all the drawbacks of slavery, it should be noted that slavery was the earliest form of social security in the United States. It was the legal responsibility of the master to take care of aged workers. It is true that the average ages to which slaves lived were less than those of the whites. But the difference was not great, and a similar difference exists between the races today. Charles Grayson Summersell Award for Most Distinguished Undergraduate History Student. Established in 1974, this award is given annually to the most distinguished under-graduate student in history. This award carries a monetary prize. Charles Grayson Summersell Memorial Scholarships. Established in 1988 by Frances S. Summersell in honor of her husband, Dr. Charles Grayson Summersell, these scholarships are awarded to juniors and seniors majoring in history. Academic merit is the primary criterion. Students must be nominated by faculty. This award carries a monetary prize. Pretty much everybody over 50 who grew up in Alabama got their Alabama history from this book or possibly from something even worse — more revisionist, if that is possible. It explains a hell of a lot of the racial attitudes we encounter, particularly on the part of older folks. The Social Security thing is mind boggling. People really believed that???? WTF kind of education indoctrination did it take to prepare kids to swallow stories like that? This reminds me of how the Soviets re-worked history books to suit the Party's goals. Looks like the Confederates beat them to it by fifty years or so. Daddy was in the Air Force and I didn't have this text book. No wonder we “celebrate” Robert E Lee day. This was right at the height of “Massive Resistance” being mounted across the South against the implementation of the 1954 Brown v. Board of Education decision. In my opinion, this book was part of a concerted propaganda effort, going all the way back to Appomatox, to rehabilitate the Confederate slave state. Anyone who gets the award or the scholarship should be called out as a recipient of the “Charles Grayson Summersell Slavery Defense Award”. Because that is what it is. when will Alabama stop honoring traitors and white supremacists as heroes worthy of a holiday? Exactly what did Jefferson Davis and Robert E. Lee do for Alabama except cause suffering? Why does the miscegenation clause remain in Alabama's constitution? Is white supremacist ideology actually a political platform in Alabama? Do the majority of voting citizens in Alabama not realize the historical connotation of state rights? Why did Governor Bentley or his campaign officials refuse to answer my questions concerning his state rights platform and the Civil Rights and Voting Rights Act? The textbook is awful, but I would be careful to lay at its feet (if textbooks have feet) the blame for a host of attitudes. It is a symptom, a means of propagating a viewpoint, but it is not the origin of the viewpoint. The textbook was chosen by school officials and promoted by viewpoint advocates. As has been noted, we see this kind of crap going on all over: Texas revisionist history; Kansas and Texas and Pennsylvania battles over the teaching of science. In those cases, it’s obvious the people are to blame for demanding unreasonable textbooks; the textbooks are not blamed for existing. Thank goodness California, with its very large textbook-buying clout, has publicly resolved not to buy any textbook that was written to conform to the Texas anti-science guidelines. I wish more states would do that. I once in my stupid youth called my pa and ma educational sharecroppers. To my credit I didn’t hold that opinion long. My father was principal of George Washington Carver High School in Scottsboro, Alabama during the good old days. I came home from college one Christmas holiday. He said, come with me. He drove us to Carver H. S., two blocks away. We went to his office. He gave me an Alabama history book. He had marked pages with strips of paper. I read the pages, yep, the revisionist history approved by folks in the glorious good old days. He showed me boxes of the books, all but one unopened. He did not use the books in the school. Instead he contacted a friend at Columbia University. The friend sent him mimeo copy of Alabama history which he made copies for the students of George Washington Carver to use. My pa didn’t sit in or march as I did, but his way was more effective and long lived. He, my mother, and the other teachers at Carver saved the brains of many black children. about slavery. Addressing Republicans in Iowa, she explained that the “founding fathers” had never rested until they had eliminated all slavery from this nation. John Quincy Adams comes in for special recognition for abolishing slavery. I suppose this means that the Republican Party was not founded specifically to block the spread of slavery and that Lincoln never wrote an Emancipation Proclamation. There must not have really been a Civil War, to hear her version. This sounds pretty much exactly like what my father taught me as a child. I'm sure the Mississippi History books he studied were similar. I was educated in Catholic parochial schools in Miami. Not a redneck to be seen anywhere, just wimples and habits. Even so, I was taught that slavery was only a peripheral contributor to the Civil War, which was actually fought over the Federal government's attempt to deny states' rights. We were taught to call it “The War between the States”, which is better than “The War against Northern Agression”. It was much later, in college, that I realized that the only states' right important enough to fight a war over was the right to own other human beings. You would think the Catholic clergy, mostly Irish, would have been more sympathetic to the oppressed,rather than the oppressors.